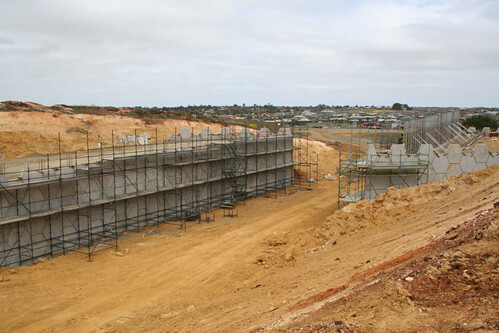 As usual we start down at Geelong, were I paid a visit to the future Geelong Ring Road interchange at Waurn Ponds. 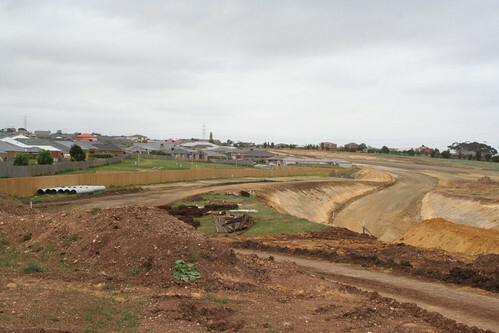 This interchange opened in June 2009 as the terminus of stage 3, with the freeway extended south towards Colac in 2011. I also headed south-west from Geelong to Warrnambool, on the trail of the final El Zorro operated container serivce. The line from Geelong to Warrnambool is single track, with the only place available for opposing trains to pass being Camperdown. Freight trains still run on the line today, but the loop at Warncoort provides another place for trains to pass. While at Warrnambool I followed the remains of the Port Fairy railway. The Port Fairy line closed in 1977, but the section to Dennington remained open until 2002, to permit the delivery of briquettes to the neighbouring Nestle factory. I also drove west of Geelong, chasing a ballast train at work on the main Melbourne-Adelaide railway. Another long drive took me north to Wycheproof, where the railway runs down the middle of the main street. Steamrail Victoria had ran a special train up to Wycheproof for the weekend. A group of mates came along for the chase. And every time we got ahead of the train, we’d pull over to take a photo of it. At North Geelong I was lucky enough to catch track inspection vehicle EM100 head past on another tour of the network. The aging vehicle is still in service today, but increasingly out of service due to mechanical faults. Back in 2008 two carriage trains on the Geelong line were a common sight. But platform extension works were underway – this is Marshall station. And the city end of North Melbourne platform 5 and 6. The work was to allow the operation of 7-car VLocity trains in peak times, which commenced in November 2008 and continued operating until June 2015, when the expansion of 2-car VLocity sets to 3-cars made such an arrangement impossible. Upgrades to North Melbourne station were also continuing. With the escalators between platform and concourse now in place. But the concourse made no difference to trains stuck on increasingly congested tracks. It took until 2015 for V/Line trains to be separated from suburban trains at North Melbourne, with the opening of the first stage of Regional Rail Link. But passengers on the Hurstbridge line were seeing one of their bottlenecks removed. With work on a $52 million project to duplicate 750m of single track between Clifton Hill and Westgarth station underway, featuring a new bridge over the Merri Creek. The second track opened in 2009, paving the way for the Heidelberg-Rosanna duplication completed in 2018. Another bottleneck since removed is the level crossing at Clayton, visible behind this citybound Connex train. But some things never change – like vandals riding the coupler of trains, tagging the rear windscreen. And the abandoned Webb Dock railway. Running beneath the West Gate Bridge, it once linked the port to the rest of Victoria. The last train used the line in 1992, with the city end dismantled in the 1990s to make way for the Melbourne Docklands development. There have been various proposals to reopen the line to transport freight to Webb Dock, reducing the number of trucks on the road, but they have come to nought.